Headline Image: The UFO as captured on US Navy camera. A BIZARRE UFO that “defied physics” outmanoeuvred several F-18 pilots during a terrifying encounter, a former senior US national security chief who spent time at the mysterious Area 51 military base has sensationally claimed. 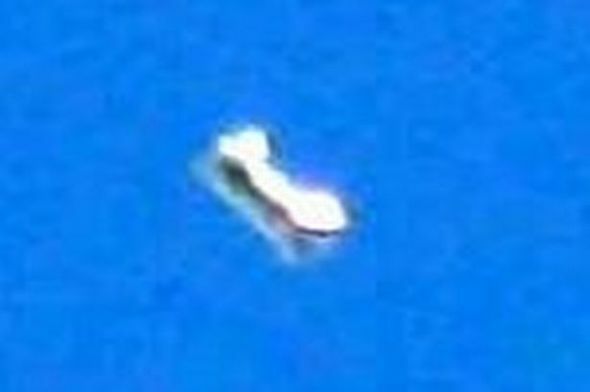 US Navy personnel aboard the USS Nimitz even filmed the UFO during the encounter that lasted several hours, according to Chris Mellon. Mr Mellon served for almost 20 years in the US federal government in a series of national security positions roles under presidents Bill Clinton and George W Bush. The ex-national security chief, who had high-level clearance, was on a committee with oversight of all Department of Defence (DoD) special access programmes and spent a decade on the Senate Intelligence Committee, is one of a number of former senior government insiders who have gone on record about UFOs after joining truth-seeking organisation To The Stars Academy, set up by former Blink 182 frontman Tom DeLonge. Mr Mellon, who also work on classified projects at Area 51 in Nevada, detailed the astonishing incident that reportedly happened off the coast of San Diego in broad daylight. He said the Mimitz, a five billion dollar warship with a crew of thousands, was operating there, escorted by the USS Princeton, an Aegis class cruiser. Mr Mellon said: “Imagine these ships engaging in a routine training exercise when an unidentified aircraft with a small radar cross section appears on the radar heading directly towards the battlegroup. “The aircraft has no transponder does not respond to radio calls. The Princeton contacts two F-18s already aloft to intercept the target as the two F-18s approach the four aviators see that the object has no wings or exhaust. He said one pilot pursued the craft while his wing man stayed high in the air. Mr Melon said: “The pilots are astonished to see the object suddenly reorient itself toward the approaching F-18. “In a series of discreet tumbling manoeuvres that seem to defy the laws of physics. “The object takes a position directly behind the approaching F-18. “The pilot’s capture gun camera footage and infrared imagery of the object. The pilots returned to the Nimitz, but the object remained in the area for several hours he said. He added: “At one point the object soars to 80,000 feet, hovers, then drops at supersonic speeds coming to a full stop a mere 50 feet above the ocean where it resumes hovering. “More F-18s are dispatched but with similar results. “As before the engagement occurs in broad daylight in the secret machine easily evades the F-18s. “Dozens of military personnel aboard the various planes and ships involved are privy to these interactions. “Clearly this is not an experimental US aircraft, but whose is it? He has suggested that the US Congress should investigate the events. He said: “The chairman of the Armed Services Committee and his counterparts and other congressional oversight committees can easily request a briefing to confirm the veracity of this story and the existence of other events of a similar nature. “Congress has every right to review the documents generated by this event and request briefings by the military personnel involved. “If the oversight committees have not already been briefed on this event and others like it they clearly should be.